Recently, one of my readers asked about a substitute for sugarcane in my Chao Tom (Vietnamese Shrimp Paste Wrapped Sugarcane) recipe. Well, the whole point of chao tom is that the sugarcane juices will flavor the shrimp as it cooks. So if sugarcane is not readily available, and you don't want to just wrap the shrimp on skewers, might I suggest turning it into tom tau hu ky (Vietnamese shrimp paste wrapped in bean curd skin)? I first encountered this dish almost a decade ago at Da Nang Com Tam Tran Quy Cap in Little Saigon. Their version is still the best in town with its succulent shrimp paste and crispy bean curd skin. A must whenever I order a plate of broken rice. Making it is super easy. 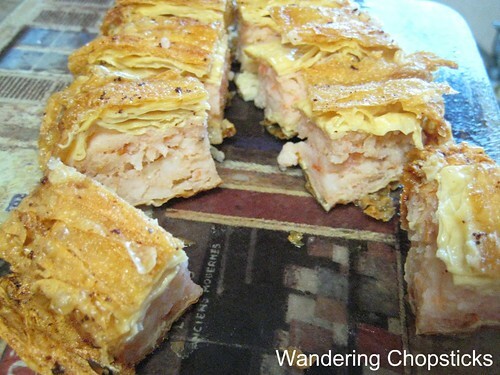 It's finding the bean curd skin that may be the hard part for some of you. 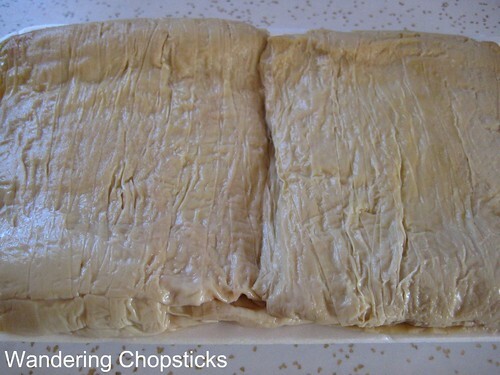 Bean curd skin or tofu skin is the film that forms on top of soy milk during production. It can be found fresh, dried, or frozen so check all areas of your local Asian grocery store if you're having difficulty finding it. I've basically taken my chao tom recipe for the filling, wrapped it in the bean curd skin and deep-fried it. Peel and devein the shrimp. Place shrimp in a colander and sprinkle 1/2 tsp salt, mix thoroughly and allow to drain. In a food processor, grind shrimp with garlic, 2 tsp sugar, and a few dashes of fish sauce, until a smooth paste is formed. 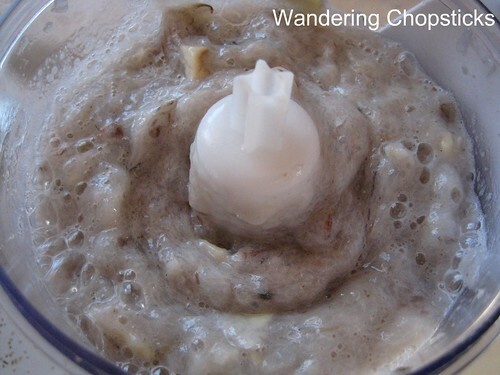 You may need to add a little bit of cold water for the shrimp paste to smooth out and become "fluffy." The shrimp should look somewhat like the photo below. 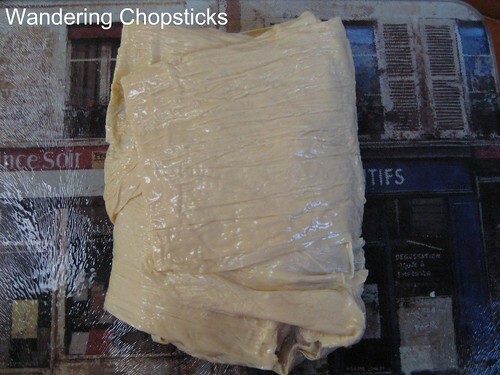 Take a small chunk of the paste and pop it in the microwave for a few seconds to cook. Taste and adjust salt and sugar if necessary. 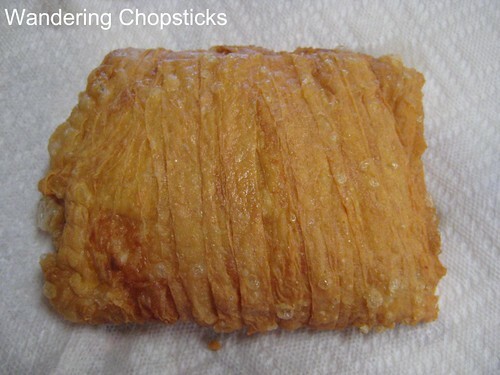 I used fresh bean curd skin, which was a little difficult to separate. Dried and frozen skins can be easily separated into single skins for use. 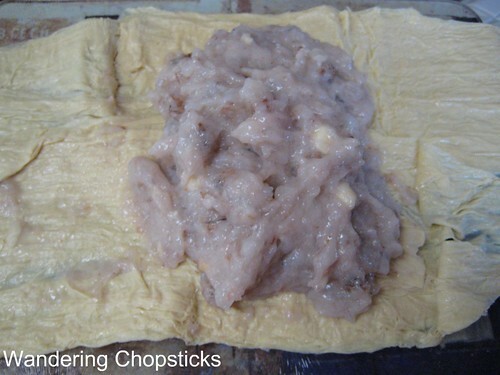 Place half the shrimp paste in the middle of a bean curd skin and wrap. You'll get a little parcel that looks sort of like this. Deep fry on medium-high heat until crispy and golden. Slice in half, and then again in the other direction in smaller pieces. And serve with rice or pork chops if you wish. 1 year ago today, Pumpkin Curry and Toasted Pumpkin Seeds from the sugar pumpkins I grew in my garden. I HAD to find this post when you mentioned posting about yuba too. This looks really delicious. 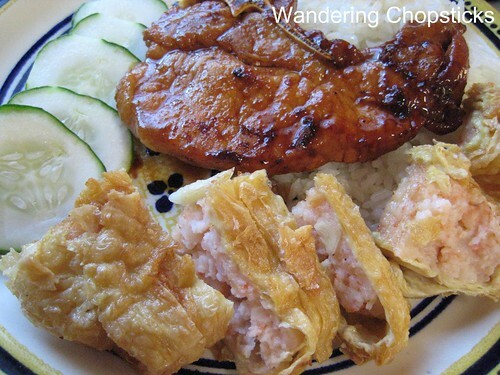 I understand that bean curd skin is great for making a crispy wrap by deep frying and this sure looks good! thank you...this just gave me an idea if I can't find the bean curd...i have seen tofu pockets packed sometimes with sushi and i could fill these and then fry them too. Hi WC - Looks great - I love this stuff, great texture, and when done well it taste fab. Yummy! I made both versions (RM & yours)... both are yummy! One thing though ... my bean curd sheets always tears! It's hard to keep it together! If you want to be healthy, you can steam this too. Oooh, that sounds like a good variation too. I think the key is to not be skimpy on the shrimp. How come NoCal doesn't have what SoCal has? Mmm must add this recipe to my queue. I love tau hu ky! This was so easy to make. Really!